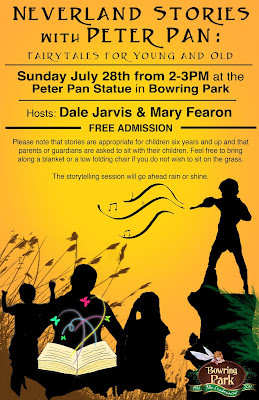 This Sunday, July 28th, at 2pm, Bowring Park park is hosting “Neverland stories with Peter Pan: Fairytales for Young and Old.” Families are invited to bring a blanket or lawn chair, and join us for an hour of free, family-friendly fairytales, told by the Peter Pan statue. The idea for the program started back in February when I got an email from Gayna Rowe, who is the Office Administrator for the Bowring Park Foundation. Bowring Park is celebrating its Centennial in 2014 and the Bowring Park Foundation has a committee in place to plan events for this special birthday. One of the suggestions of the committee was to have storytelling sessions in Bowring Park during the summer of 2014, and Gayna asked if I could meet with them to explore this possibility. I, perhaps unsurprisingly, said yes! We had a great first meeting, and out of that and other conversations grew this Sunday’s “Neverland Stories” event. The event is a pilot of sorts, to see what the public’s reaction will be. If it works, we will hopefully be back next summer with a regular series of storytelling at the Peter Pan statue, in time for the Park’s 100th anniversary. 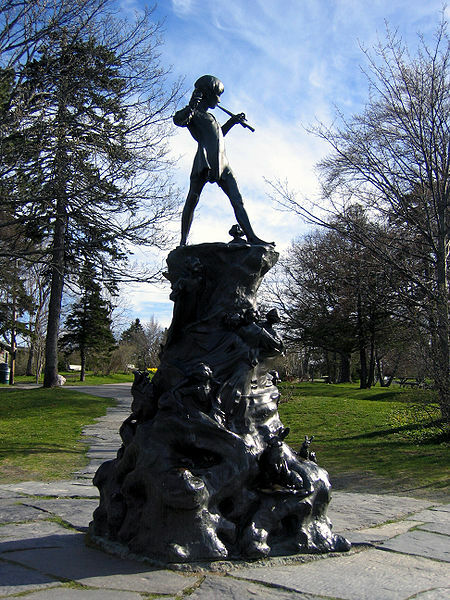 Bowring Park's beloved Peter Pan, unveiled in 1925, is one of the park's most prominent and popular attractions. 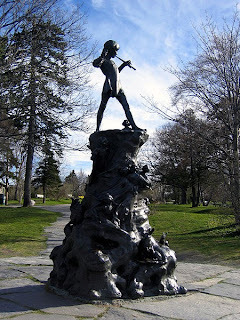 The Peter Pan monument was donated to Bowring Park by Sir Edgar R. Bowring, in memory of his little granddaughter, Betty Munn, who was lost in the S.S. Florizel disaster in February, 1918. My idea to centre the stories around the Peter Pan statue was based on a project of the late storyteller Diane Wolkstein, who helped solidify a Saturday morning tradition of storytelling at the Hans Christian Andersen statue in New York’s Central Park. Over the last 50 years, generations of children have gathered there to hear stories from all around the world. The Peter Pan statue is our version of that iconic monument, and I’m excited to help start what will hopefully be a new tradition of storytelling in Bowring Park. Performing alongside me for the first show will be my friend Mary Fearon, a much-loved Newfoundland storyteller who has been performing professionally since 1997. During that time, she has performed and run workshops at a variety of festivals, schools and other events both here in Newfoundland & Labrador and in Australia. Her interest in traditional Newfoundland material inspired her to co-develop the book, "Over The Big Fat Waves; A Collection Of Newfoundland & Labrador Rhymes, Songs and Language Games." Mary and I have told stories together in schools and festivals around the province, and, according to The Independent, she is one of the most interesting people in Newfoundland! Mary and I will be telling fairytales from Newfoundland and around the globe, full of foolish heroes, magic and adventure. Admission is free, and we hope to see you there! Sounds like a great event! I wish something like that was put on around me... I would love something like that.